I clipped out the recipe for this soup a couple of years ago. I believe it's from an old issue of Cooking Light, however, proof of its source was hastily removed when I cut and pasted it on cardstock and slip-sheeted it into a plastic sleeve to file in "the binder." Well...said binder has finally sustained an injury (to its spine)...most likely as a result of my little cookbook project and the requisite loading and unloading of recipe pages. The fact that I also have file folders stuffed into this binder -- themselves bulging with recipes that are awaiting their own ceremonial cut and paste -- no doubt contributed to this incident. Recognizing the rapidly ailing nature of my "sophisticated" organizational system (one I'm assuming others might relate to), I am further energized to continue my quest to catalog our favorites and get them into a more suitable home...though the process seems daunting at times. Ugh! 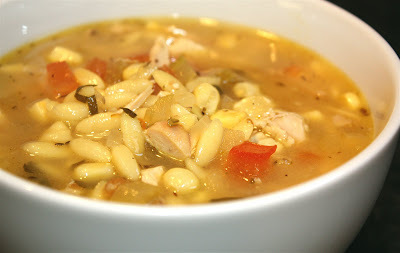 On a more amenable topic, this soup is a favorite of all in our family (especially our oldest). The combination of orzo, white corn, fresh tomato, and flat-leaf parsley lends this soup a bit of a Mediterranean flair...which, of course, I love. It's also a little different from the other broth-prominent soups I make in that it has a distinct lemony tang...another plus in my book. And it calls for saffron -- somewhat exotic, even in my growing cache of spices -- which adds to the soup's golden color (and name!) and its unique earthy flavor. 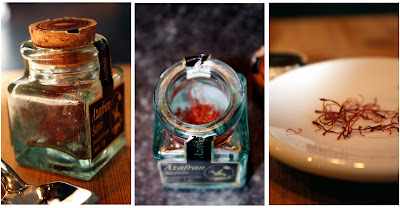 The good news is that, while pricey, saffron has a long shelf life. If you store it in a cool, dry place, it will last for two to three years before it starts to lose its flavor. I've read that it doesn't really go bad after this timeframe but rather just diminishes more and more in flavor. While I haven't purchased saffron lately, I believe a small bottle will run about $10 to $15 so sharing it with a friend might be a good way to justify the purchase. After all, you use so little. It's definitely taken at least two years for me to make a dent in my little stash. The rest of the ingredients for this soup are super easy (and economical) to pull together -- roasted chicken from the market, frozen corn, and a good pre-made chicken broth -- making it an effortless, quick option for a busy night. Round it out with a crusty, oven-warmed baguette and a green salad and dinner is on the table in 30 minutes!! 1. Bring a medium saucepan of well-salted water to boil in preparation for your orzo. 2. Heat oil in a large stockpot over medium high heat. Add celery, onion, saffron, and thyme. Cook until veggies start to soften, stirring occasionally, about 5 to 6 minutes. Add chicken broth and bring to a boil. Reduce heat to a simmer and add chicken and continue cooking until veggies are tender, about 15 minutes. 3. While soup simmers, add orzo to boiling water in saucepan. Boil until tender, about 8 to 10 minutes. Drain and put aside. 4. 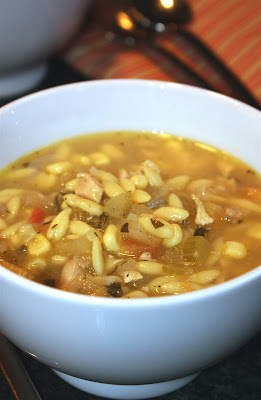 When soup has simmered its alloted time, add orzo, corn, tomato, and parsley to pot. Cook just until corn is heated through, about 2 minutes. Stir in the lemon juice and season, to taste, with salt and pepper. Add more lemon, if desired.